Mrs. Lance's Second Grade Class - Tulips! After enjoying 3 days of 70 and 80 degree temperatures it snowed! We had to put on our winter coats again. 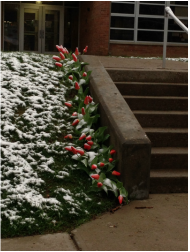 We are not happy about the snow and neither are our tulips! Spring has finally sprung and our tulips are in bloom. However, it is supposed to snow tonight. Do you think it's going to snow? What will happen to our tulips? We planted our tulip bulbs in November, and it started to snow in December. It hasn't stopped snowing since. It has snowed a lot this winter. We have had 5 snow days so far this year. Although it has warmed up this week, the snow is still covering the ground. It was a high of 58 degrees today. We are waiting for the snow to melt and our tulips to sprout. The Beard Family pitched in to help the tulip planting. For three days after school the Beard boys helped their dad mulch the tulip beds. The boys loved digging in the dirt and got especially muddy on a few of the days. 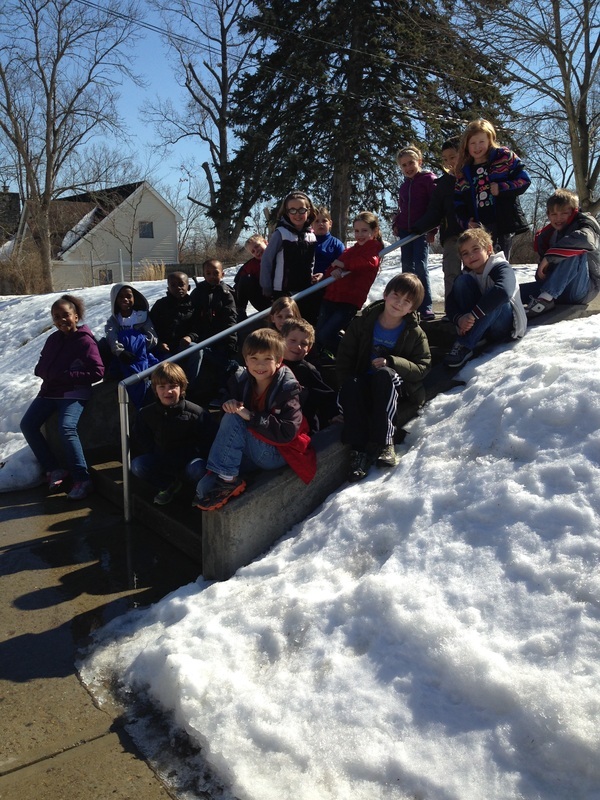 They can't wait to see the bulbs bloom in the spring to see how their hard work paid off. Today we planted rainbow colored and red tulips by the stairs of our school. We had to first dig out some dirt. We had to dig holes 7 inches deep. Then we sprinkled it with compost from our school. Then we put the bulbs in the ground. We had to make sure the stem was up and the roots were down. We scraped some dirt back on the bulbs. We also scraped off the dirt on the steps and the edge of the steps. When we were finished we had to shuffle around the playground to get the dirt off of our shoes. Every class in the school planted tulip bulbs this week. We will watch to see when the bulbs sprout in the spring. Then we will go to the Journey North website and document our observations. 1) Has your class ever planted tulips? If yes, where? 2) What tips do you have for planting tulips? 3) If you've planted tulips, how did your planting go? The students of our school planted 300 tulip bulbs in November of 2013. We will participate in the Journey North Tulip Project and watch them bloom.